Visitors and natives alike enjoy using the Washington State Ferries to travel to and from the islands, or across Puget Sound. The ferries can accommodate passengers with cars, bicycles, or on foot. Drivers may remain in their vehicle or spend the trip up in the passenger areas. Ferry terminals in the Seattle area can be found at Pier 52 on the downtown waterfront, or farther north in the city of Edmonds. Take advantage of this low key and scenic mode of travel to visit many different Puget Sound locales. Plan on arriving at least 30 minutes prior to scheduled loading times. During some times and on some routes, waits can be two hours or longer for vehicle boarding, particularly on summer weekends. It is always wise to check conditions on the day of your trip. These official Washington State Ferry resources will help you plan for your specific trip. Find out about current mechanical problems, construction, or other issues that might cancel or limit service on certain routes. Another way to get up-to-the-minute ferry status is to subscribe to the WSDOT Ferries Twitter feed or e-mail alerts. Advanced reservations can be made for a few especially busy routes. Ferry fares vary considerably depending on the size of your vehicle and the distance your route travels. Tickets can be purchased in advance online or at a terminal tollbooth or kiosk. Frequent riders can use their Wave2Go or ORCA cards. Consult the WSDOT Ferries website to find current fare information for your particular needs. The Washington State Ferries are used by business and recreation travelers to get to an island or to cross Puget Sound. To get from here to there. But sometimes, you want to ride the ferry just to experience the ferry and to take in the scenery. In this case, a fun and relaxing option is to choose one of these frequent routes and to ride as a passenger, leaving your car behind. These routes take you to small waterfront communities where you can walk and explore shops, restaurants, and natural areas, before your return ride. There's quite a bit to explore within walking distance of the ferry dock. You'll have to walk through a few blocks of residential area to get to the lovely marina area and downtown shops, galleries, and restaurants. If you want to make a full day of it, take your car to explore more of Bainbridge Island and nearby Kitsap Peninsula, or enjoy a guided tour with Kitsap Tours. 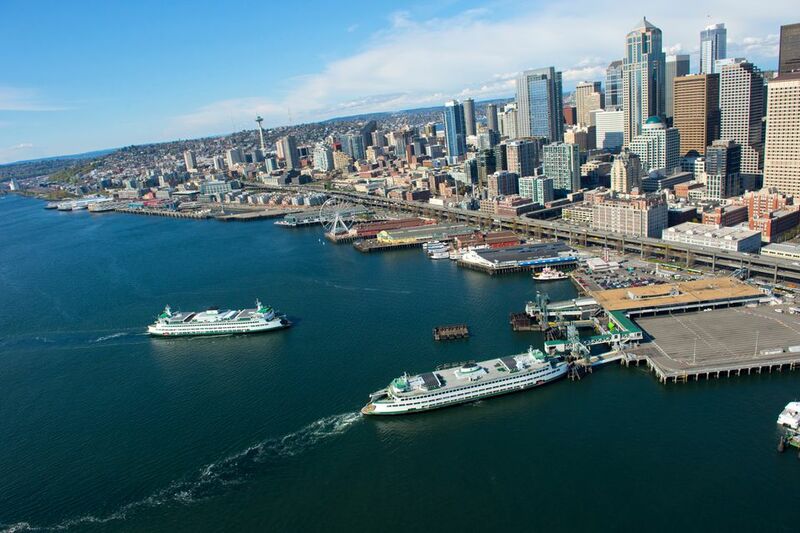 This route also allows you to enjoy magnificent views of downtown Seattle from the ferry. While there is less to see and do at the Kingston ferry dock area than there is at Bainbridge Island, the actual ferry trip is a bit longer and you'll see more of the Puget Sound. The 23 vessels in the Washington State Ferry system come in a variety of sizes. The largest ferries are over 400 feet long and can accommodate up to 200 cars and 2,500 passengers. The smallest ferry in the fleet, the Hiyu, is 160 feet long and can handle up to 34 cars and 200 passengers. What's the Legal Drinking Age in Washington?